Twenty weeks today! The ultrasound looked good and the doctor was quite enthusiastic about how the cord is looking. With each passing week there is more hope that this will be a cord that giveth and not a cord that taketh away. Still, there are scary moments, especially in the mornings. According to Dr. Collins, when babies die it more often occurs at night, perhaps because of changes in maternal blood pressure. Just one more thing to worry about. I go to bed quite late and then wake up too early in a cold sweat, though sometimes I can get back to sleep after confirming that Mei-mei is still alive. Will I actually end up sleeping better if I have a demanding nocturnal newborn? I hope to find out! Mom's hoarding reaches a new low when she rescues 17 pounds of expired (in 2008!) and partially liquified cheddar cheese from the dumpster after a brave family member threw it out. 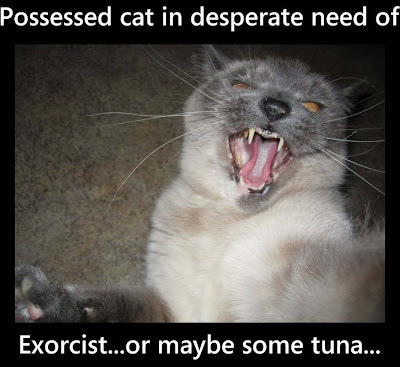 Brother tries to perform an exorcism on the cat, not realizing that demons cannot be cast out of cats because cats are demons. Some of THE cheese. Yes, really. Glad to hear everything looks good with the cord and with Mei Mei! Hang in there...she'll be here before you know it! So glad you have gotten this far, my fingers and toes are crossed for the second half of your pregnancy. Yay for twenty weeks!!! ;) Still praying for you friend. We could be sisters. I'm just sayin'. So glad that Mei-mei is doing well, and hoping that you get a good night's sleep soon. Congrats on reaching 20 weeks! This is great! Hey girl Im catching up on your blog and I couldnt be happier at how well things are going...I understand that there is still hurdles to cross but so far seems your jumping through every one without any problems:) So truly happy for you and think of you often! So glad things are looking good at the 20 week mark. Family drama is never fun, sorry to hear about it. I would be wary of eating any cheese dishes your mom makes anytime in the near future.